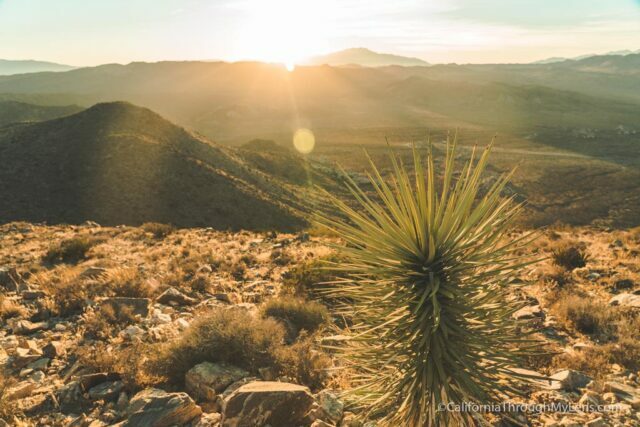 Ryan Mountain is located in the heart of Joshua Tree National Park, and much like the Mist Trail in Yosemite, its an epic hike, but a tough one. 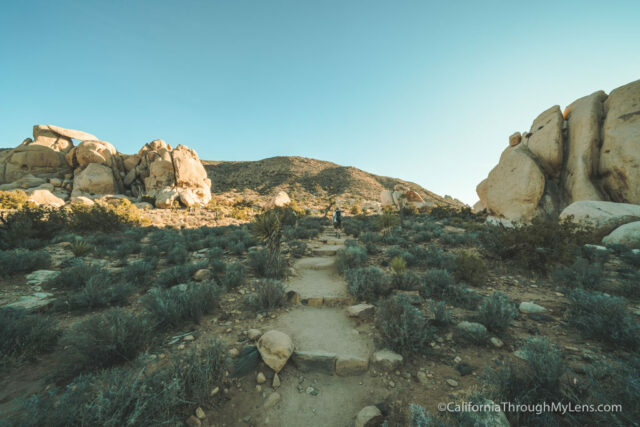 Don’t let the 1.5 miles each way confuse you; you will be going directly up the entire time to reach the summit of the second tallest peak in Joshua Tree National Park. 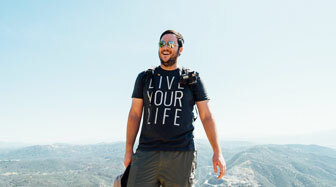 That being said, it is an epic hike and one that I love doing for sunset. 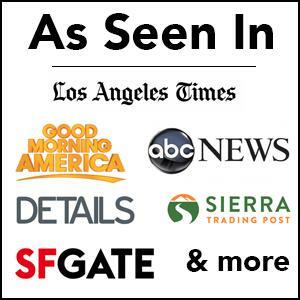 Here is all the information if you want to check it out. 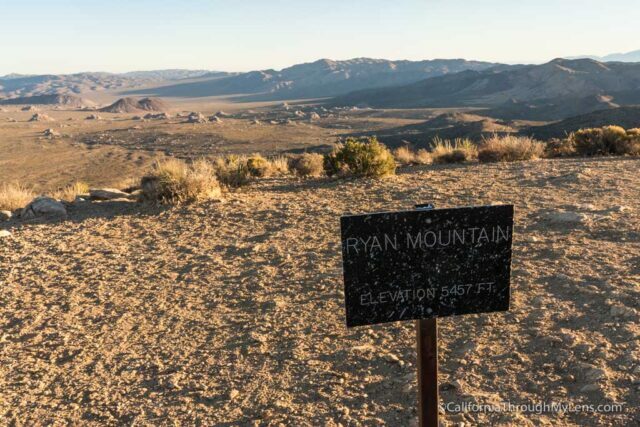 Ryan Mountain is located right in the middle of the park and is closest to the west entrance. It is easy to find and has a parking lot that is located right on the main road. 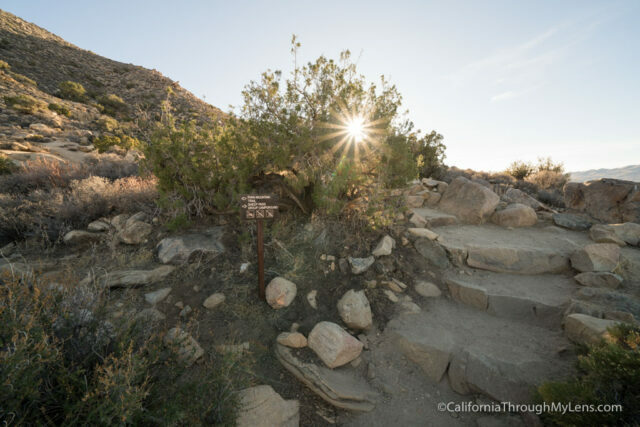 Unlike some of the smaller hikes, it is clearly marked and has a bathroom at the base. We went on a weekday, and the parking lot was about 50% full, I imagine on a weekend it is probably even busier and parking may be more difficult, but since they hike is short it does turn over relatively fast. 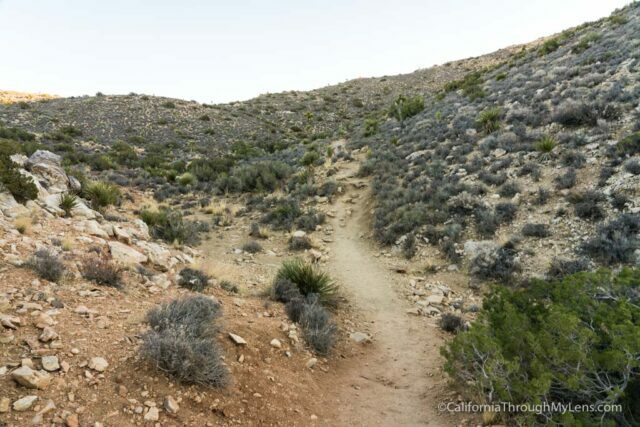 The trail is around 3 miles round trip, but the elevation gain is a little over 1,200 feet. This means that the hike gains elevation pretty quickly. 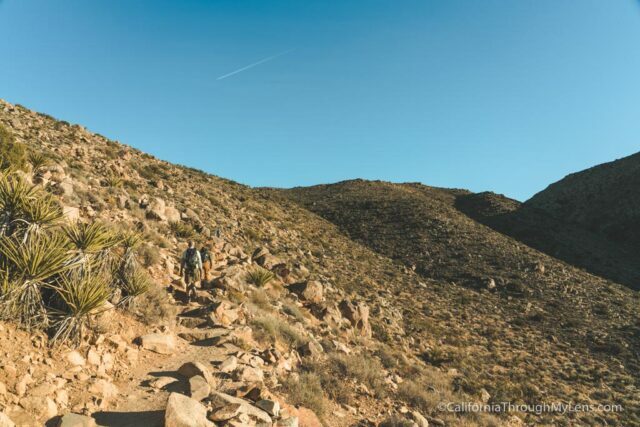 While it is not especially difficult, you want to make sure you take your time if you are not used to this type of hiking and do not do it in the heat of summer. 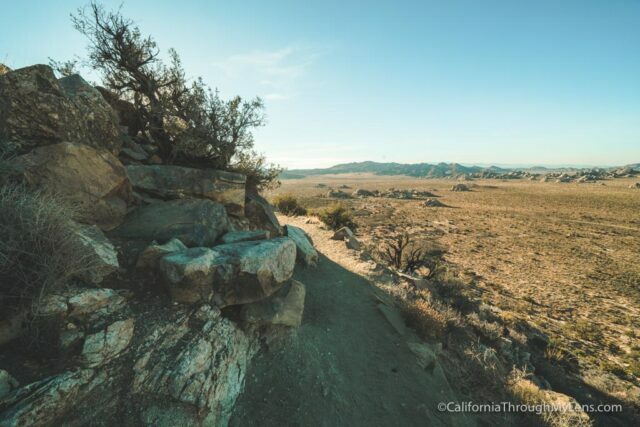 From the trailhead, you will start out going past some large rocks that are popular for climbing. The trail continues to head up, on a combination of roughly hewn stone steps and standard dirt trail. 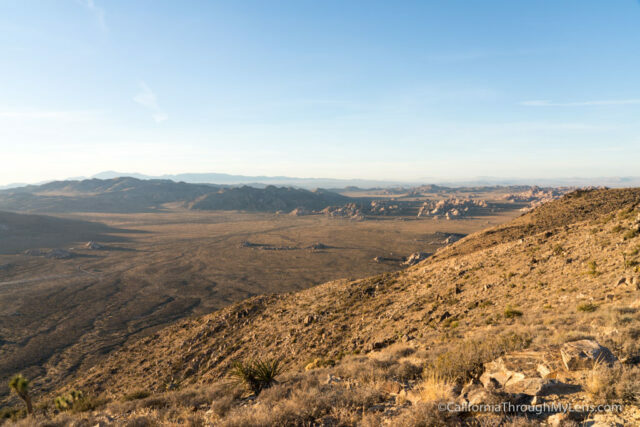 The views are epic almost immediately as the flat desert terrain stretches out in front of you as you make your way up the hill. The hike hugs the side of the mountain for about a mile before heading inland for the summit push. The path is well maintained the entire way and has a wide variety of trees, flowers, and cactus to check out as you are hiking. Also, as you start to get higher up you can see all of the people climbing the different rocks in the park. There was almost never a rock I saw that didn’t have the silhouette of someone climbing it or standing on its top. It truly is a mecca for rock climbers. If you squint, you can see the profile of a rock climber at the top of the rock in the picture above. After heading inland, there will be two more pushes before you reach the summit. Reaching the summit allows you to see one of the best views in the entire park. 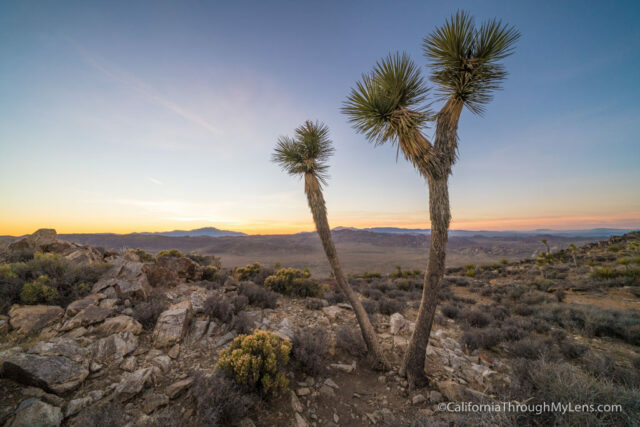 This 360-degree vantage point looks out over the flat desert landscape, and it is impressive to see how many Joshua Trees are dotting the ground below you. 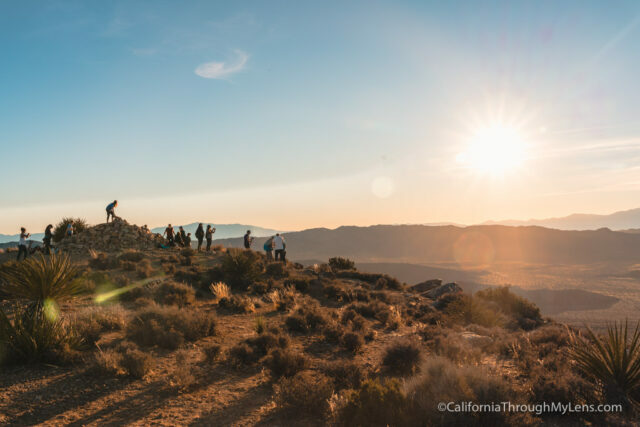 The summit itself is around 5,400 feet, so it gets you significantly higher than anywhere else in the park and on a clear day you can even see San Jacinto and San Gorgonio in the distance. 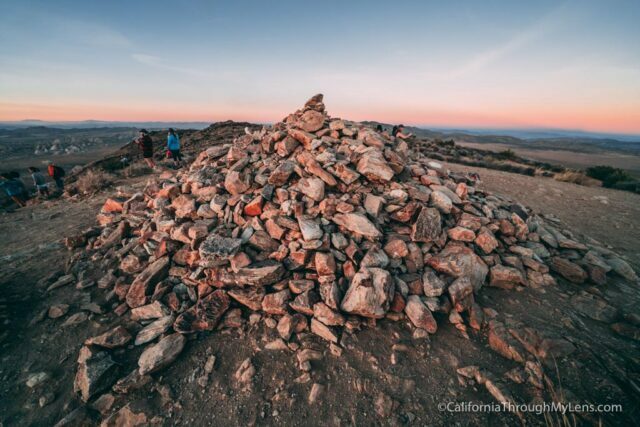 There is a rock pile on the summit that I saw many people standing on to get full 360-degree photos. When we were there, there were only 5 or 6 people hanging out, so it was nice to have such a beautiful summit to ourselves. On a busy holiday weekend, I have seen more than 30 up here. Also, if you have the chance, hike up for sunset. This is probably the best view in the park for sunset and something you will not soon forget. Do be sure to have a headlamp for the descent though. 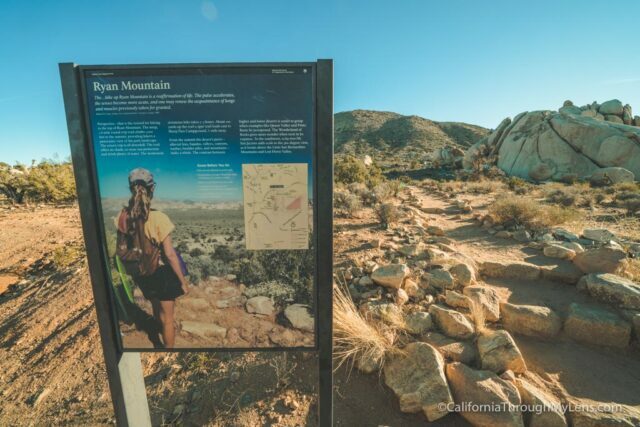 Ryan Mountain is a must do hike if you make your way out to Joshua Tree National Park. 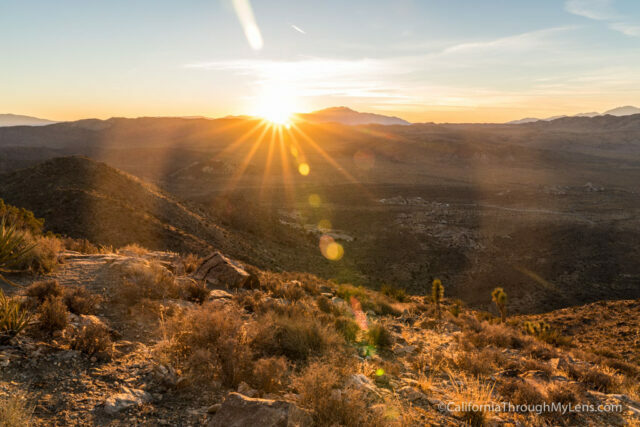 Sure it is more difficult than most of the other hikes in the park, but the views are so rewarding that you would be crazy to miss it, especially at sunset. I recommend taking as long as you need to hike up, it’s worth it as soon as you make it to the summit. Let me know what you think in the comments.